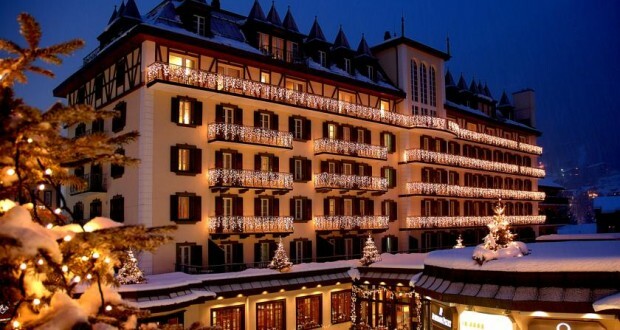 A member of “Leading Hotels of the World,” the 5-star Mont Cervin Palace was opened in 1851. It is in the heart of Zermatt, 330 yards from the train station. You can find relaxation in the pool and in the 18,300-ft² wellness and spa area and indulge in a wide range of beauty treatments. Most of the guest rooms face south and have a balcony or a patio with views of the Matterhorn. A few of the junior suites and suites come with a hot tub or an open fireplace. Wireless internet is available in all rooms free of charge. A rich breakfast buffet and an exquisite dinner are served every day. At the Grill Le Cervin meat and fish are prepared on the charcoal grill. At the weekly gala dinners in the hotel restaurant (in winter), a jacket and tie are required (smart casual). Weather permitting, the small terrace in front of the hotel invites you to take a front-row seat and watch the colorful bustle of the Bahnhofstrasse. Dinner under supervision is served to the youngest guests at 6 pm (winter only) at the children’s table of the Mont Cervin Palace. Meet for cocktails, informal conversation or an after-dinner drink in the charming Rendezvous Bar with piano music or in the Bar Le Petit Cervin offering a fine cigar assortment. The Mont Cervin’s red horse-drawn carriage is a popular photographic motif and awaits you at the station in Zermatt.